Colourful hundreds and thousands sprinkled over milk chocolate bite size pieces. Now in a new, resealable bag. 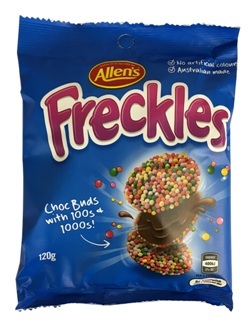 Stick these freckles (and other different lollies) onto an upside-down tub of icecream to decorate it like a cake. A quick, easy, bright, colourful and yummy birthday cake idea.